A cousin to an older Painfully Good post, I Believe I Can Fly (Flight of the Frenchies) is an up-close-and-personal film project about baseline jumping (!@!>@$?>??) by filmmaker Sebastien Montaz-Rosset. chenkx just posted this on Facebook and I had to share – watch for the thrill as he takes you high up up up then straight over the cliff as you pause just long enough to touch your toes to the rope, and then, you drop down. My palms were sweating after the first minute. See the longer segment of the film here, where a man tries to describe the freedom he feels when walking a highline with no leash. Hiromi is having the best time EVER. Hiromi Uehara started learning piano at a very young age in Japan. We just got in her sheet music at the store, including this rendition of The Tom and Jerry Show theme. Only an artist would draw all 500 of his pens with all 500 of his pens. Read more here. Buy the Studio B.I.B poster here. For Castellers, “painfully good” is an understatement. These Catalonians have been playing human jenga for centuries, starting with the strongest of men at the base and the lightest — and oftentimes youngest — fearless at the top. Forget Running with the Bulls — the intricacy and teamwork required to pull this stunt off is mind blowing. I found myself gasping each time…well, you just watch and be awed for yourself. 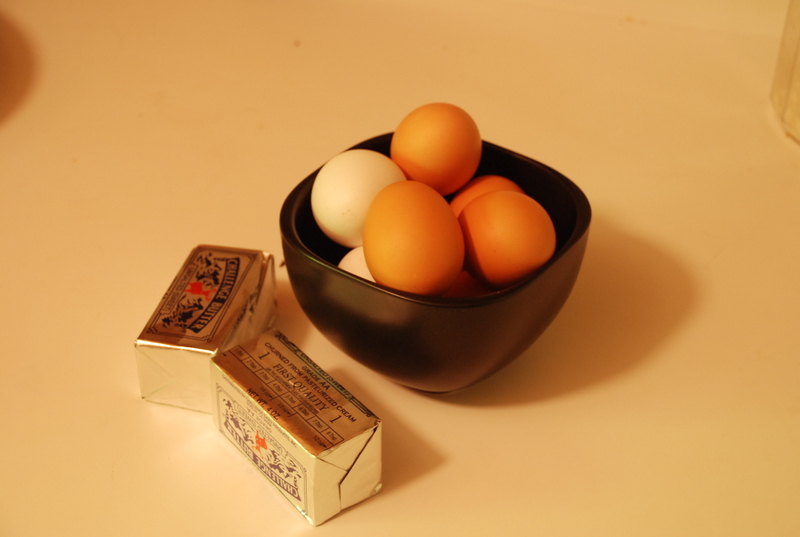 In honor of the upcoming Tour de Cluck here in Davis I thought I would post one of my favorite recipes that uses eggs. I have a small backyard flock, 3 hens, and they each lay about an egg a day. 21 eggs a week! For someone who doesn’t like eggs for breakfast, that is a LOT of eggs. I do love to bake, however. 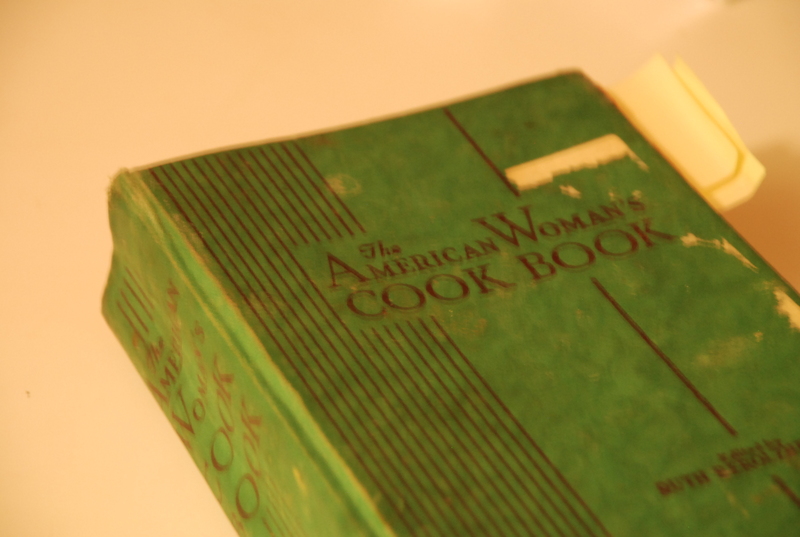 Searching for recipes that use a lot of eggs led me to my trusty “American Woman’s Cookbook” published in 1948. Every home needs a comprehensive cookbook like this. Other similar cookbooks would include The Joy of Cooking or the Fanny Farmer Cookbook. 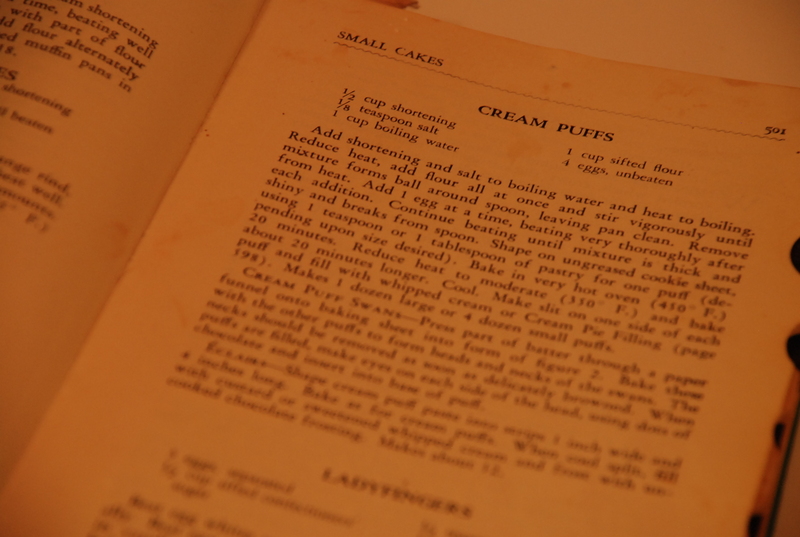 The many chapters of arcane food information include: “Useful Facts about Food”, “Soup Accessories” “Entrees and Made-Over Dishes” and “Cookies, Gingerbreads, and Small Cakes”, where I found the recipe for cream puffs. These are not the cream puffs you can get at Costco, frozen and filled with some unidentified white, sweet filling. These are substantial, puffy and light all at the same time. I like them as a base for savory or sweet fillings. To me they are equally good with a slice of cheese and a bit of meat, or drizzled w/ honey, or split and filled with freshly whipped cream. 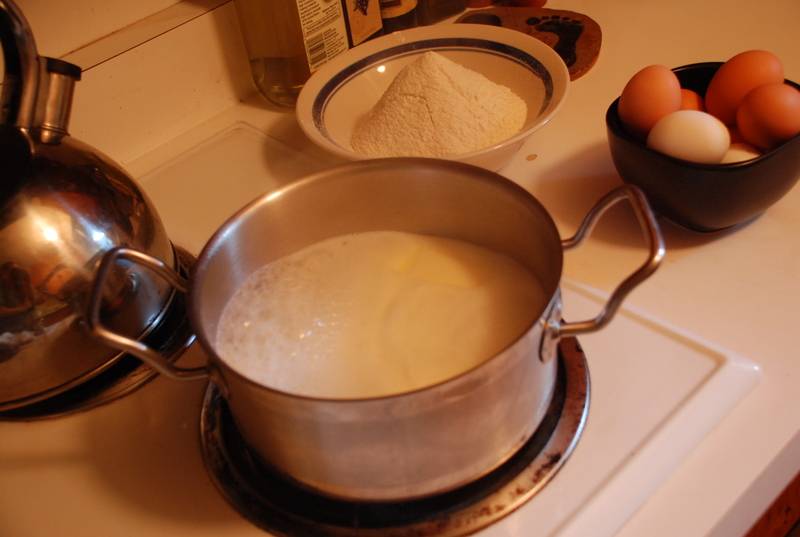 Ingredients: 2 sticks of butter, 2 cups sifted flour, 2 cups boiling water, and 8 eggs. Boil water and butter together. 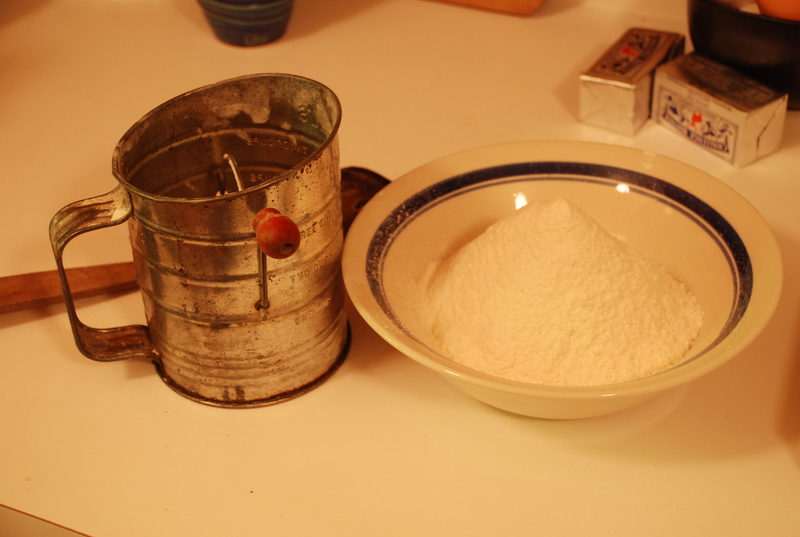 When that is boiling, turn off the heat and dump the flour in all at once. Beat vigorously with a wooden spoon. The mixture will quickly form into a ball, with a texture similar to Play-Doh. Still beating, add one egg at a time. 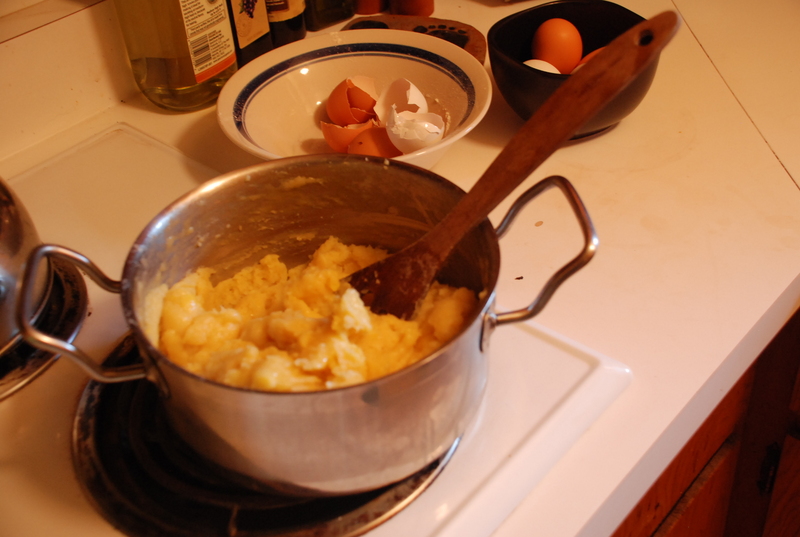 Do not add the next egg until the previous one is fully incorporated into the batter. The batter will be glossy and stiff when you are done. 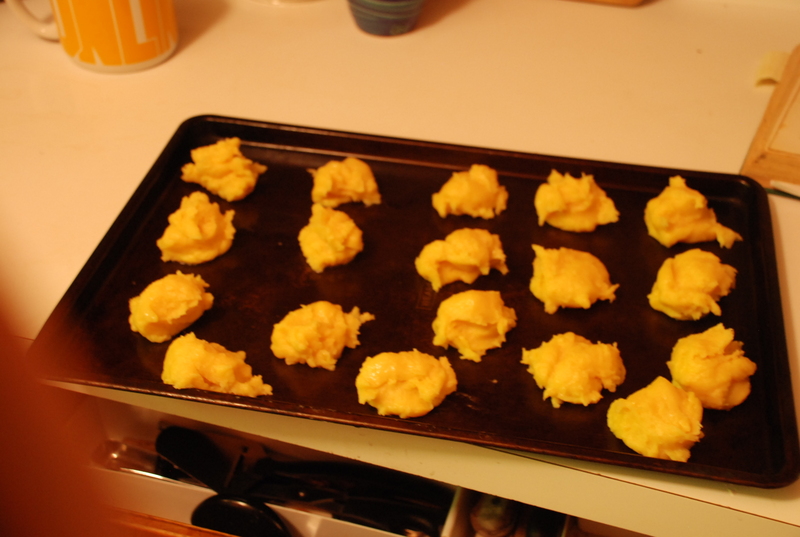 Drop by teaspoonfuls or tablespoonfuls onto an un-greased cookie sheet. The size just depends on how big you want the final puff to be. For deserts I suggest the smaller, but if you are using as sandwich rolls make them bigger. Cook at 450 degrees for 20 minutes, then turn the oven down to 350 and cook 20 minutes more.